The sukkah is a walled structure covered with organic material. On the holiday of Sukkot, Jewish people spend time in the sukkah, treating it like their home-away-from-home. 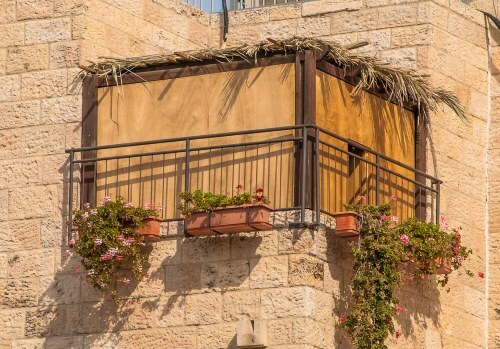 As described in the Torah, the sukkah evokes the temporary dwellings the Israelites inhabited on their way out of Egypt. The sukkah is a hut built to provide shade. That's why it must sit beneath the open sky—not under a patio deck or even the branches of a tree. The walls can be made of any material, as long as they are secure and don't flap about in the wind. The roof, however, (we call it s'chach), must be of unprocessed materials which have grown from the ground. Bamboo poles, thin wooden slats, and evergreen branches are popular choices. Just make sure to use enough s'chach so that the inside of your sukkah will have more shade than sunlight. Those living in the fast lane can buy a prefab sukkah and bamboo mats. Inquire at your local Judaica store, or click here. What Do We Do in a Sukkah? For seven days, make the sukkah your official homeFor (eight in the diaspora) days, make the sukkah your official home. Don't panic: As long as you eat your meals there, you're okay. But try to include anything else that you would normally do in the house—like reading a book or talking with a friend. We sit in the sukkah from sundown on Tishrei 14th through nightfall of the Tishrei 21 (22 in the diaspora, but without a blessing on the final day). Blessed are You, L‑rd our G‑d, King of the universe, who has sanctified us with His commandments, and commanded us to dwell in the sukkah. Raining? If it's really uncomfortable, there is no duty to sit there. Come back when the weather improves. Who Sits In a Sukkah? This beautiful mitzvah is traditionally fulfilled by the whole family, though, as with all time-related mitzvot, the obligation to eat in the sukkah applies to men over the age of 13. Why: The sukkah commemorates the Clouds of Glory which surrounded and protected our ancestors during the forty-year desert sojourn which followed the Egyptian Exodus. Our willingness to leave the security of our homes and spend eight days in a flimsy outdoor hut demonstrates our faith in G‑d and His benevolence. 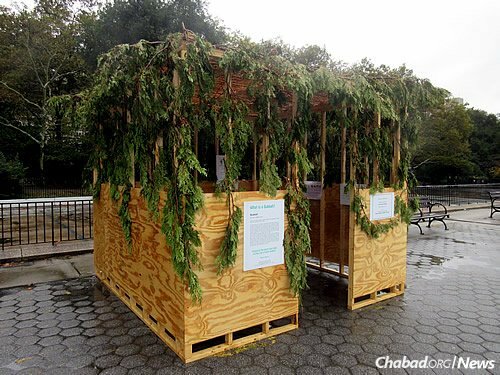 Click here for more about the sukkah. rain? "Nevertheless, many chassidim will eat in the sukkah no matter the weather." RE: when you don't have a yard While seeing the stars are nice, the most important elements of the sukka are the boughs that you sit under and the walls that surround you. I would suggest that you find a way to put up a sukkah for the duration of the holiday on your top-floor balcony. There are many of them that look very temporary (pvc and canvas construction) so that no-one would suspect you of actually doing construction on your porch. If this is entirely not feasible, perhaps you would be able to make one in your parking spot. Re: taking down our sukkah As you have correctly noted, Thursday night and Friday are out. So the earliest time to take down the Sukkah would be after Shabbat. can you build before yom kippur? Yes you can. as long as you are building it for a Sukkah. you can build at any time.